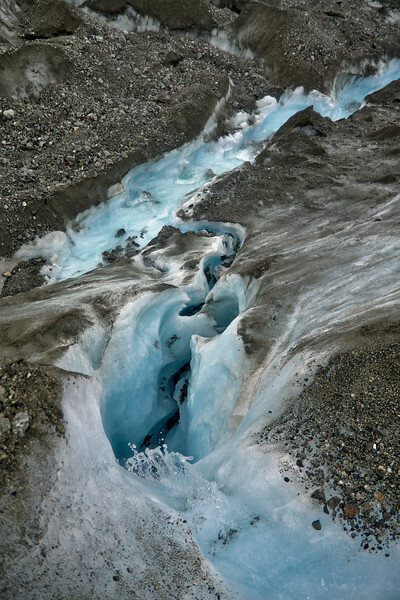 I'm fascinated by water pooling and flowing over, into, and under glacier ice. 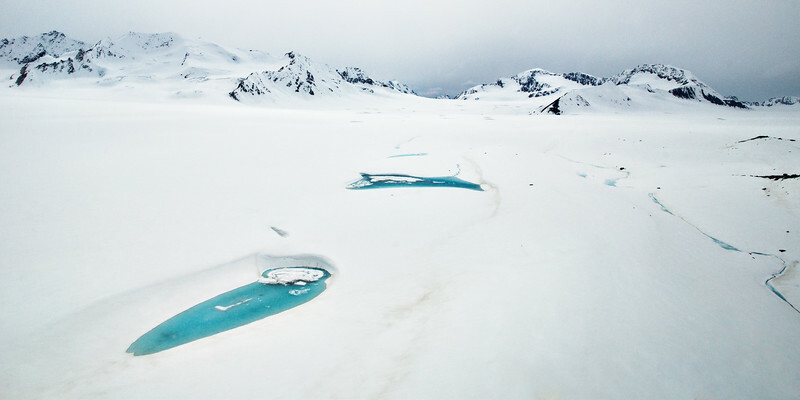 Here are a few of my favorite shots of these gorgeous and impressive works of nature. 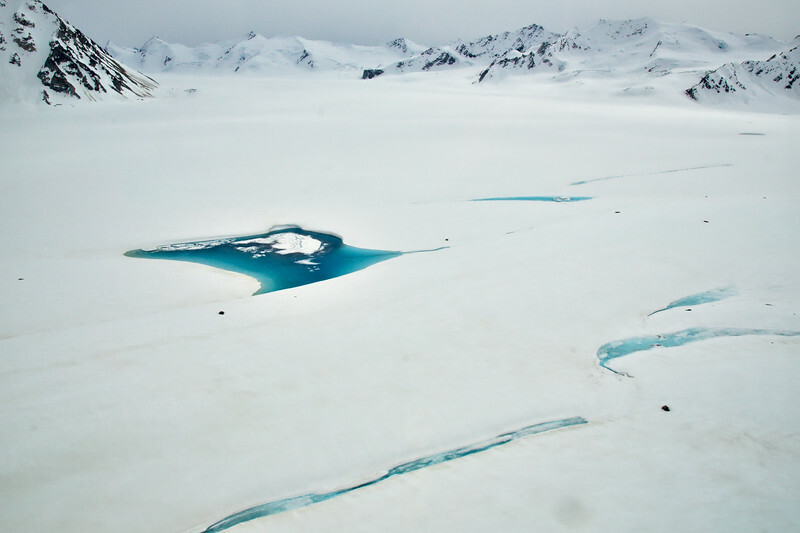 On the Canwell Glacier where the edge of the southern moraine meets exposed ice. 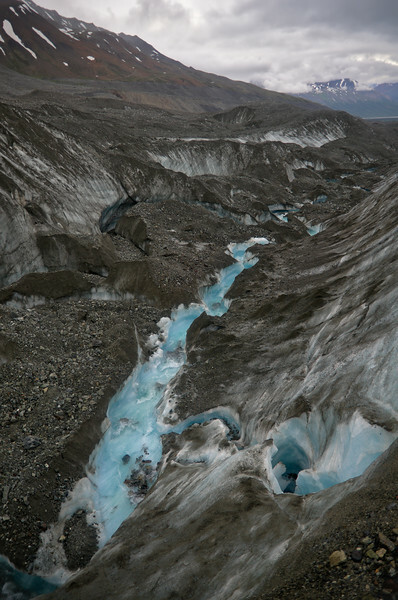 Channels typically form next to moraines like this and since this is very near the toe of the glacier it's had a long time to form this deep channel. 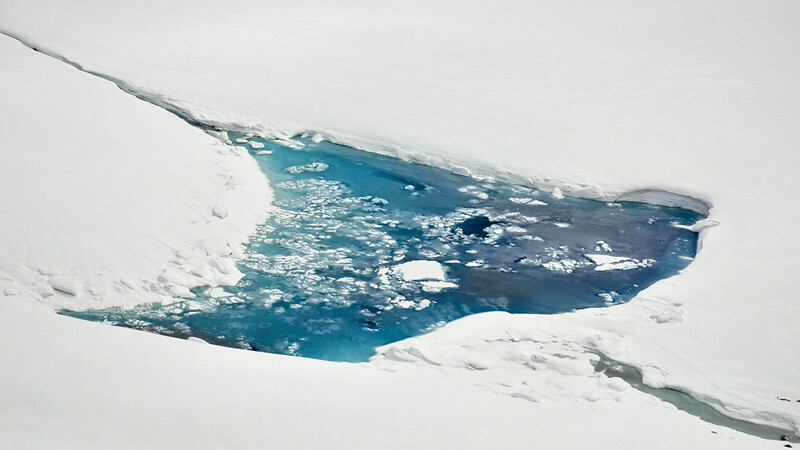 A water channel forms in the snowpack on a glacier surface. 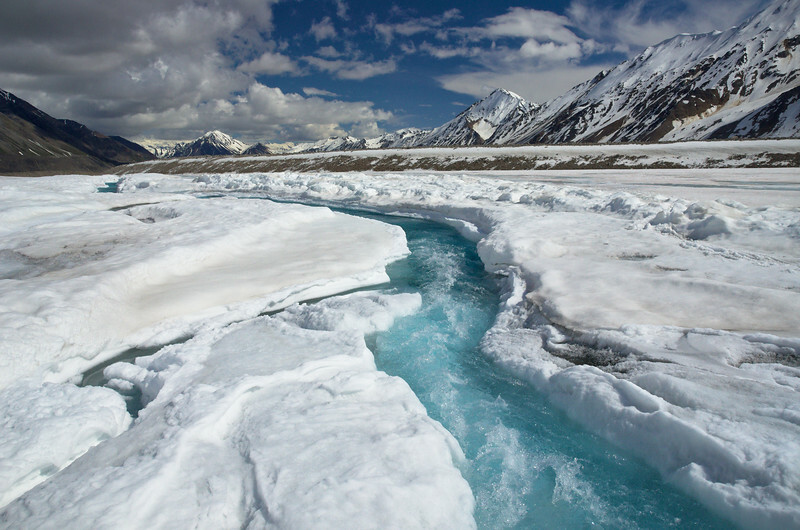 It won't be long at all before this water that is pooling in a low-lying trough will start to flow. 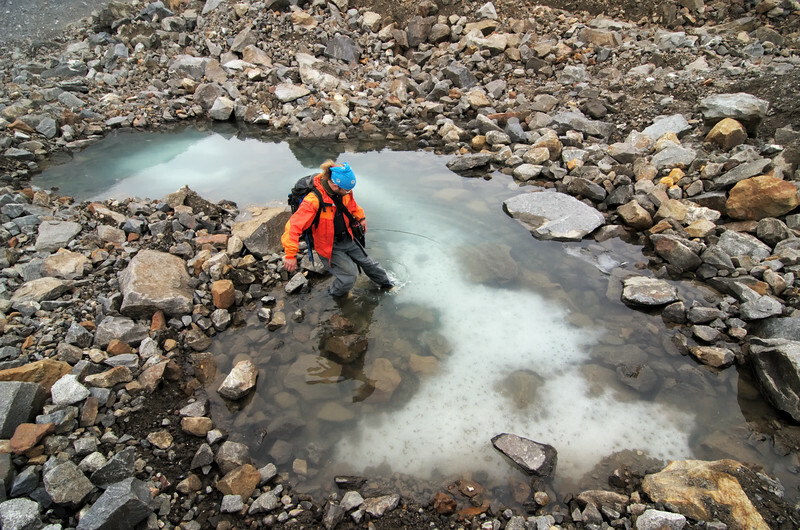 Soil and silt are deposited in small streams that refreeze trapping in layers. 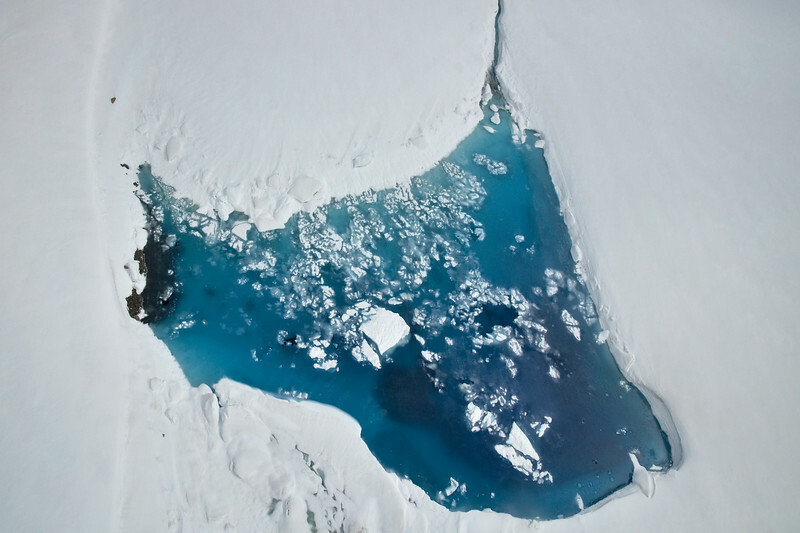 This looked like this was just ice frozen beneath the water surface, which is weird since ice floats. Andy tried kicking it to see if it was or if this was glacier ice showing through the rocky moraine. 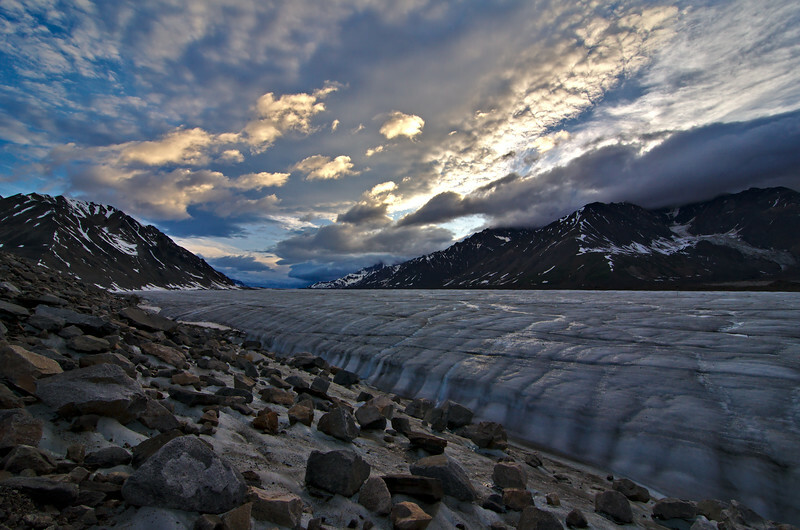 Water running on the surface of the Black Rapids Glacier glistens in the evening light shortly before sunset. 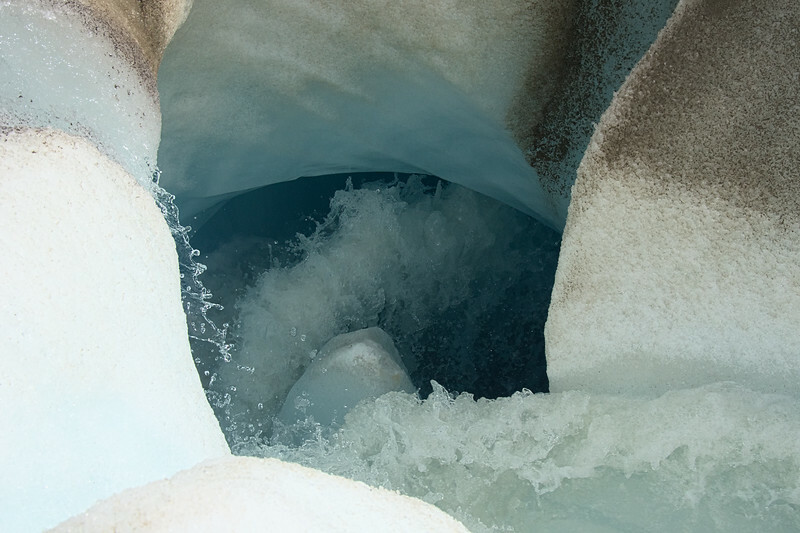 I couldn't get the angle I wanted of this waterfall into a deep and wide channel on the Canwell Glacier. I had to stand on the edge and hold the camera over it as far as I could. Should have brought some ice screws and a rope with me. Next time. 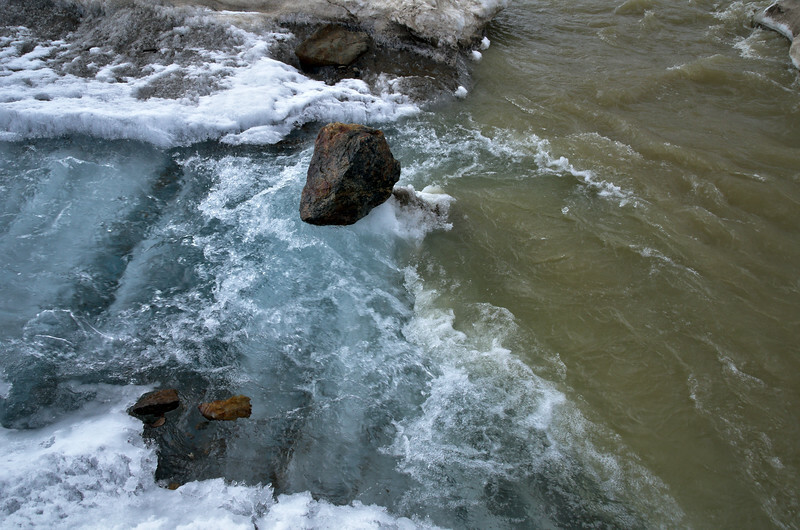 Water flows into a large moulin on a tributary to the Black Rapids Glacier. Near the margin of the glacier the water was pooling on bedrock below. 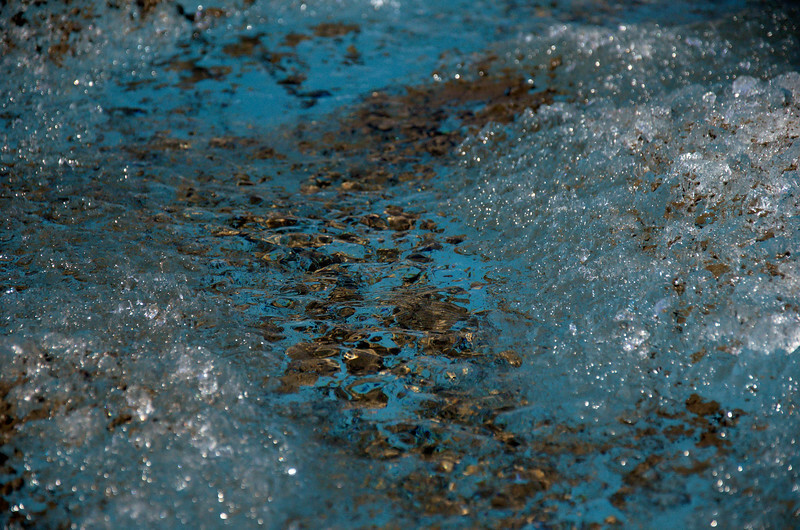 A moulin takes a cool washing machine form as water spirals down. 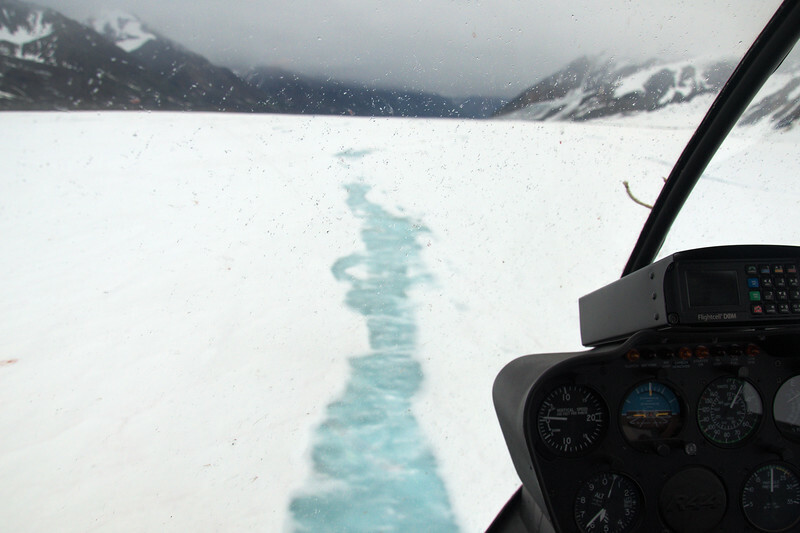 While searching for a place to land the R44 near a GPS station we find nothing but deep, wet, fully saturated snow. 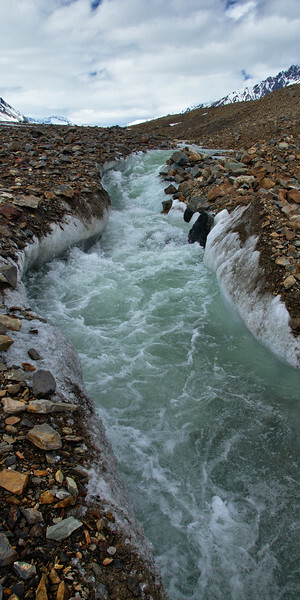 Here a water channel is starting to form in the snow high up on the glacier. Barely flowing late in the season, a bit of a dusting of snow on the ice. 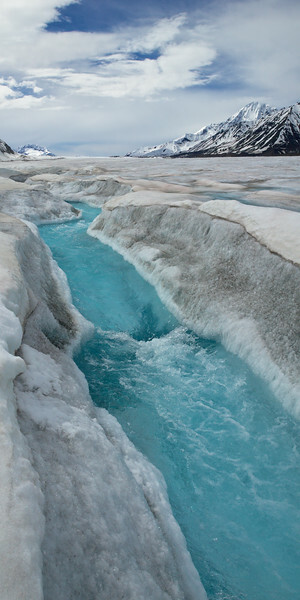 A large stream carving through the ice on the northern moraine of the Black Rapids Glacier. We couldn't find a way to safely cross on the first week. 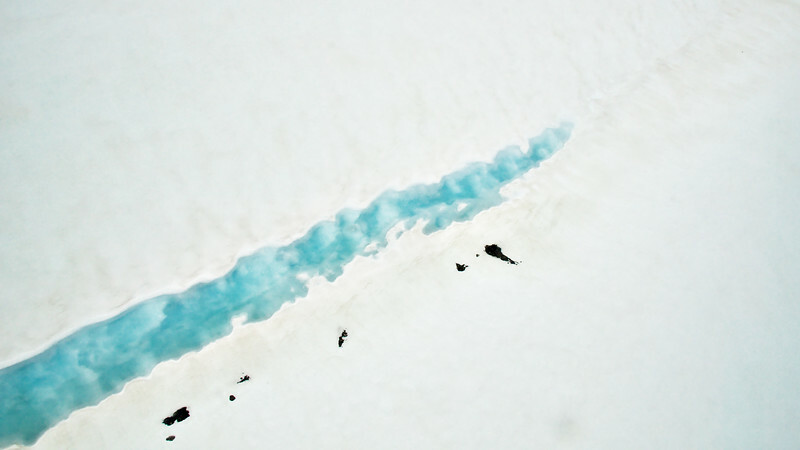 A pothole and some channels starting to form in temperate snow. Anybody want to go swimming!? 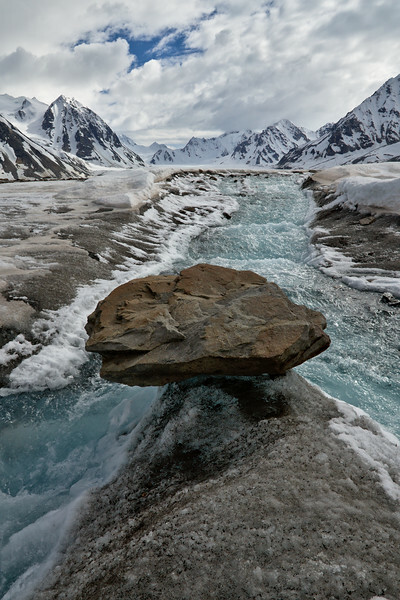 Flying over a water-filled pothole up high on the Black Rapids Glacier in the Alaska Range. On the right is rock debris from a landslide that occurred in 2002 after a 7.9 earthquake on the Denali Fault. 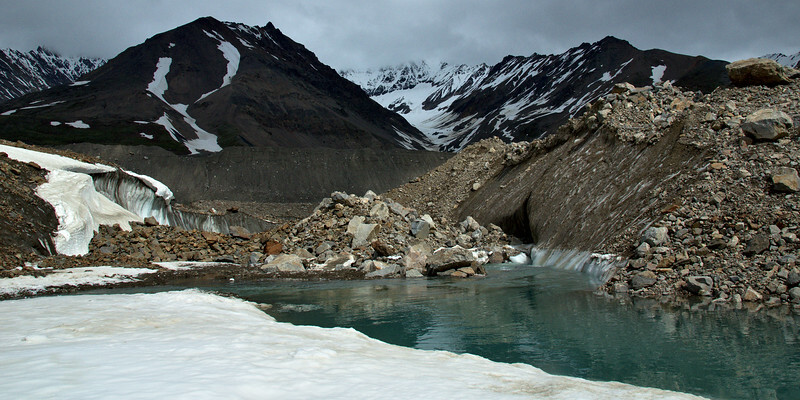 The debris crossed the entire width of the glacier, 3 km wide. The debris insulates the ice, protecting it from melt which is why it is so much higher than the ice we were standing on. 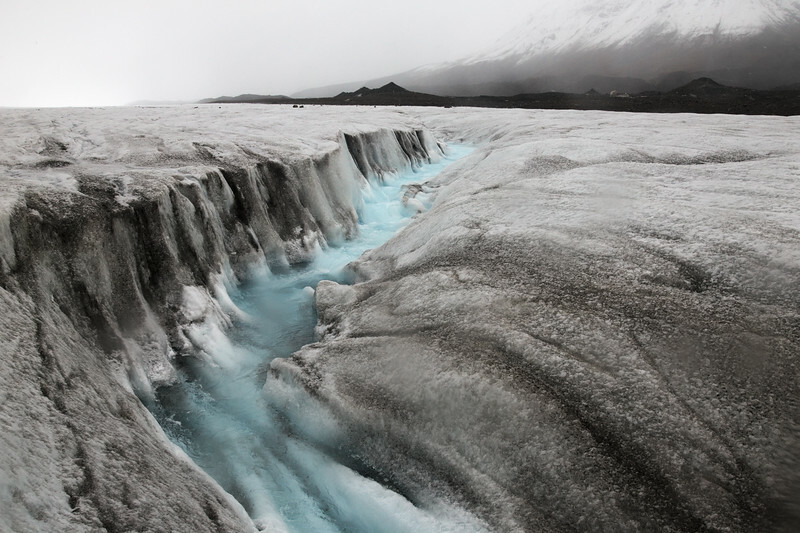 This provides a natural dam for water flowing down the streams on the glacier creating large ponds and lakes. 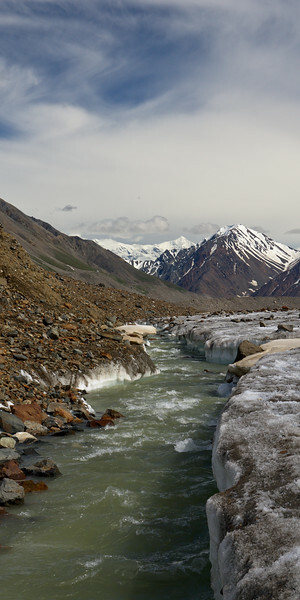 The right is a stream along the northern moraine with mountain run-off, the left is run-off from the glacier. 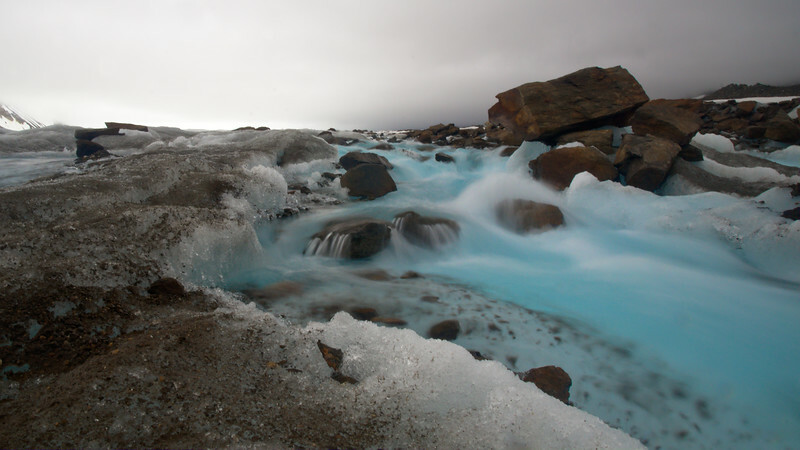 Water in a pothole up high on the Black Rapids Glacier. 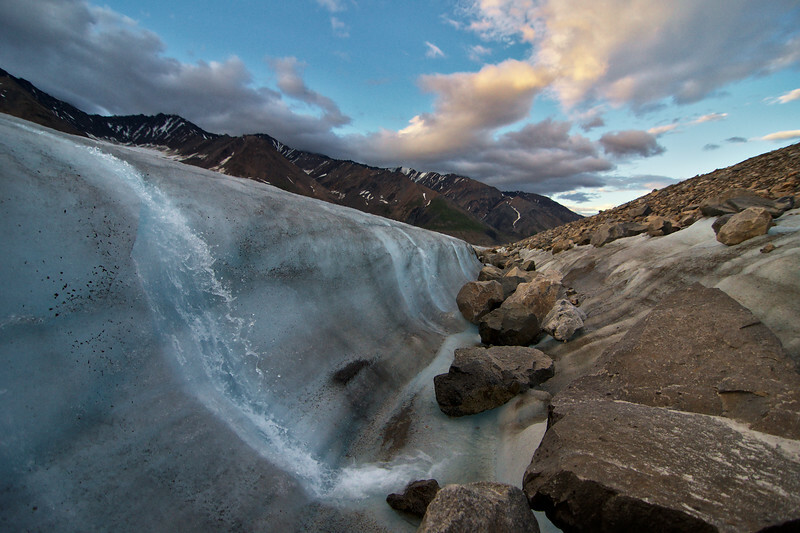 There is a water channel on the right, I believe it may be filling from Aurora Lake and then draining down-glacier.